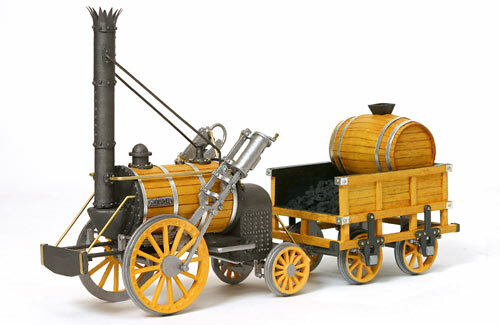 Stephenson’s locomotive “Rocket” won the Rainhill Trials On 8 October 1829 .Stephenson’s Rocket was an early steam locomotive of 0-2-2 wheel arrangement, built in 1829 at the Forth Street Works of Robert Stephenson and Company in Newcastle Upon Tyne.It was built for, and won, the Rainhill Trials held by the Liverpool & Manchester Railway in 1829 to choose the best design to power the railway.Though the Rocket was not the first steam locomotive, it was the first to bring together several innovations to produce the most advanced locomotive of its day.It is the most famous example of an evolving design of locomotives by Stephenson that became the template for most steam engines in the following 150 years.The locomotive had a tall smokestack chimney at the front, a cylindrical boiler in the middle, and a separate firebox at the rear. The large front pair of wooden wheels was driven by two external cylinders set at an angle. The smaller rear wheels were not coupled to the driving wheels, giving an 0-2-2 wheel arrangement. Stephenson designed Rocket for the Rainhill trials, and the specific rules of that contest. As the first railway intended for passengers more than freight, the rules emphasised speed and would require reliability, but the weight of the locomotive was also tightly restricted. Six-wheeled locomotives were limited to six tons, four-wheeled locomotives to four and a half tons. In particular, the weight of the train expected to be hauled was to be no more than three times the actual weight of the locomotive. Stephenson realised that whatever the size of previously successful locomotives, this new contest would favour a fast, light locomotive of only moderate hauling powStephenson’s most visible decision was to use a single pair of driving wheels, with a small carrying axle behind. This was the first 0-2-2 and first single driver locomotive.The use of single drivers gave several advantages. The weight of coupling rods was avoided and the second axle could be smaller and lightweight, as it only carried a small proportion of the weight. Rocket placed 2½ tons of its 4¼ ton total weight onto its driving wheels,a higher axle load than Sans Pareil, even though the 0-4-0 was heavier overall at 5 ton, and officially disqualified by being over the 4½ ton limit. Early locomotive designers had been concerned that the adhesion of a locomotive’s driving wheels would be inadequate, but Stephenson’s past experience convinced him that this would not be a problem, particularly with the light trains of the trials contest. Rocket uses a multi-tubular boiler design. Previous locomotive boilers consisted of a single pipe surrounded by water (though theLancashire Witch did have twin flues). Rocket has 25 copper fire-tubes that carry the hot exhaust gas from the firebox, through the wet boiler to the blast pipe and chimney. This arrangement resulted in a greatly increased surface contact area of hot pipe with boiler water when compared to a single large flue. Additionally, radiant heating from the enlarged separate firebox helped deliver a further increase in steaming and hence boiler efficiency.The advantages of the multiple-tube boiler were quickly recognised, even for heavy, slow freight locomotives. By 1830, Stephenson’s past employee Timothy Hackworth had re-designed his return-flued Royal George as the return-tubed Wilberforce class. he first album the Ramones recorded with Richie Ramone was Too Tough to Die in 1984. The band’s main release of 1985 was the British single “Bonzo Goes to Bitburg”; The following year the band recorded their last album with Richie, Halfway to Sanity,Richie left in August 1987, upset that after being in the band for four years, the other members would still not give him a share of the money they made selling T-shirts. Richie was replaced by Clem Burke from Blondie, then Dee Dee left the band as they began recording their eleventh studio album, 1989’s Brain Drain. He was replaced by Christopher Joseph Ward (C.J. Ramone), who performed with the band until they disbanded. Dee Dee initially pursued a brief career as a rapper under the name Dee Dee King. 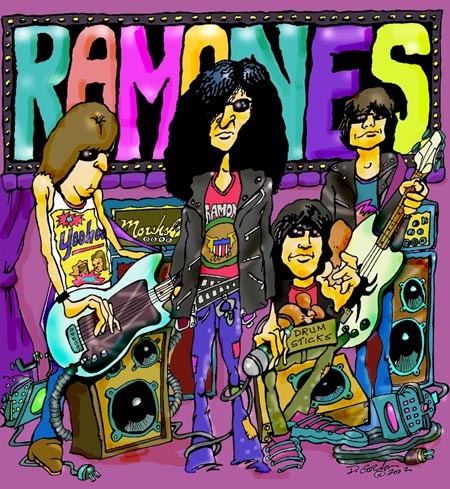 In 1995, the Ramones released ¡Adios Amigos!, their fourteenth studio album, and announced that they planned to disband if it was not successful. its sales were unremarkable, garnering it just two weeks on the lower end of the Billboard chartThe band spent late 1995 on what was promoted as a farewell tour. However, they accepted an offer to appear in the sixth Lollapalooza festival, which toured around the United States during the following summer. After the Lollapalooza tour’s conclusion, the Ramones played their final show on August 6, 1996, at the Palace in Hollywood. A recording of the concert was later released on video and CD as We’re Outta Here! In addition to a reappearance by Dee Dee, the show featured several guests including Motörhead’s Lemmy, Pearl Jam’s Eddie Vedder, Soundgarden’s Chris Cornell, and Rancid’s Tim Armstrong and Lars Frederiksen and disbanded After having performed 2,263 concerts, touring virtually nonstop for 22 years. Little more than eight years after the breakup, the band’s three founding members had all passed away—lead singer Joey Ramone, guitarist Johnny Ramone in 2004 and bassist Dee Dee Ramone in 2002.Sadly heir only record with enough U.S. sales to be certified gold was the compilation album Ramones Mania. However, recognition of the band’s importance built over the years, and they are now cited in many assessments of all-time great rock music, such as the Rolling Stone list of the 50 Greatest Artists of All Time and VH1′s 100 Greatest Artists of Hard Rock. In 2002, the Ramones were ranked the second-greatest band of all time by Spin magazine, trailing only The Beatles. On March 18, 2002, the Ramones—including the three founders and drummers Tommy and Marky Ramone—were inducted into the Rock and Roll Hall of Fame. In 2011, the group was awarded a Grammy Lifetime Achievement Award.